First of all, I survived Chuck E. Cheese and actually had a good time. It was not super busy (on a Saturday afternoon??? ), so it was sort of fun to play the games and drink a few beers hang out with the kids. So back to the original theme of this post, I had an interesting day thrifting on Thursday. I found this newer pitcher which sort of matches some other pieces that I have bought recently from Home Goods. It has a distressed vintage look and was $1.91. 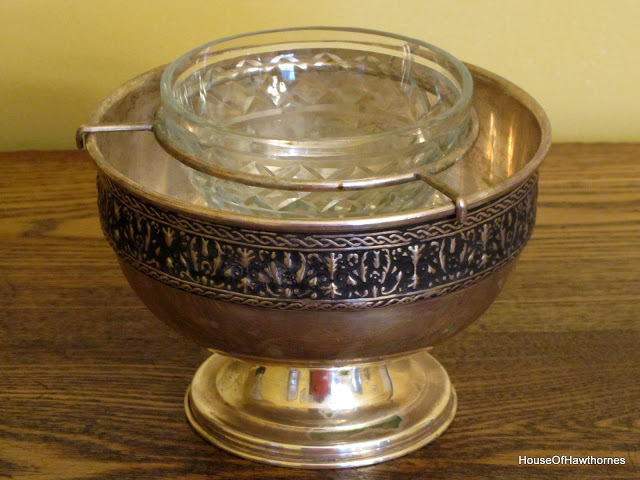 I thought this might be a shrimp cocktail bowl, but when researching it I found that it is probably a caviar server. 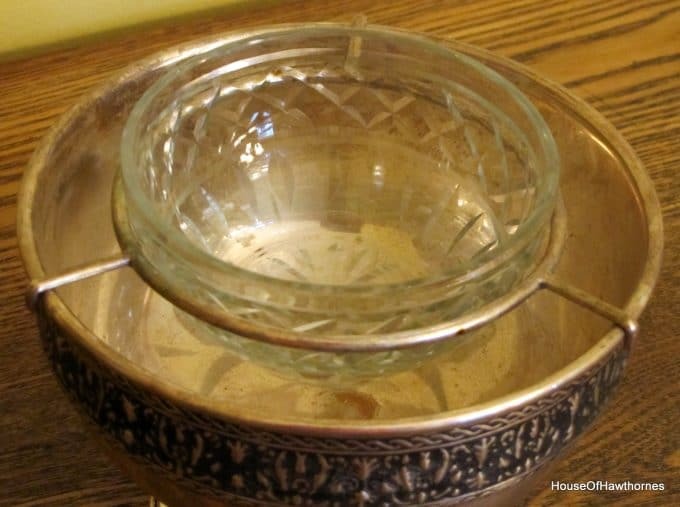 You would put ice in the silver bowl and caviar in the glass bowl. This only cost $2.92 and was very heavy. Not sure if it’s silver plated or sterling silver, but based on its weight I am leaning toward sterling. Since I have so rarely (as in like never ever before in my life) eaten caviar, I’m thinking of using it to keep chip dip cold. 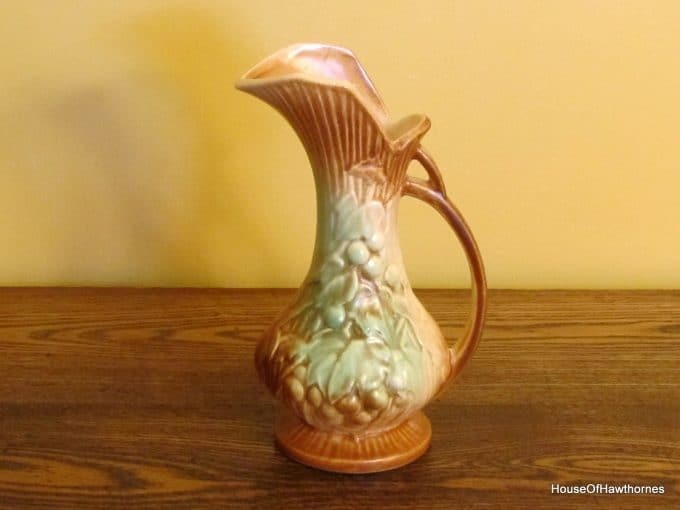 And I bought this extremely homely pitcher for $1.91. It’s a mottled brown and green leaf and grape design. So why did I buy it if it’s so darn ugly?
. . . . . It’s a McCoy!!! I have never found a McCoy piece in a thrift store before now. 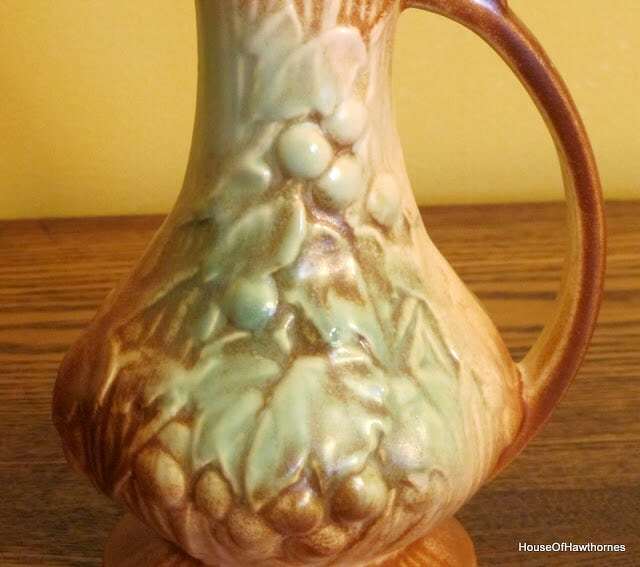 Right now on eBay these pitchers are going for between $7.00 (for a chipped pitcher) and $45.00 and on Etsy there is one for $49.99 and one for $115.00. For now I will hold onto it and see if it grows on me. And if it never does (chances are pretty good that it won’t) then I can sell it on my Etsy shop when I get it up and running. Although the McCoy piece was pretty cool to find, my favorite purchase was this soup tureen for $2.92. I’ve been looking for one with the matching ladle and plate for a while now, but had never seen one in a thrift store before. And strangely enough I had just commented to Donna at Sugar, Spice & Southern Life last week that they were too expensive at the antique stores. Does that ever happen to you? You talk about something in blogland and then next thing you know you run across one. Maybe it’s my ESP working again. Wow! Great finds. 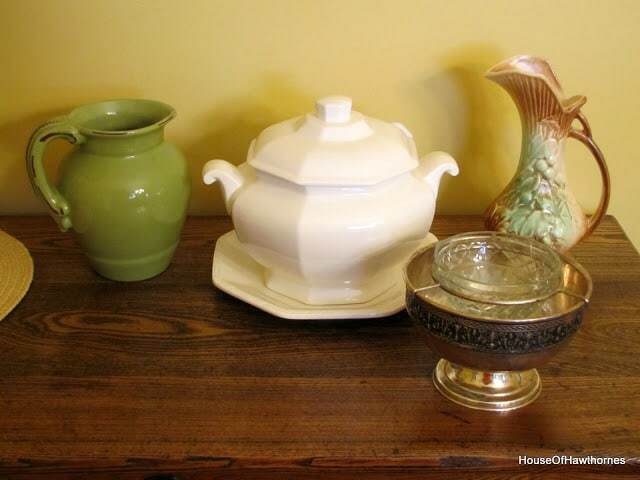 I love the little green pitcher and the soup tureen ( I didnt know that’s what it was called). 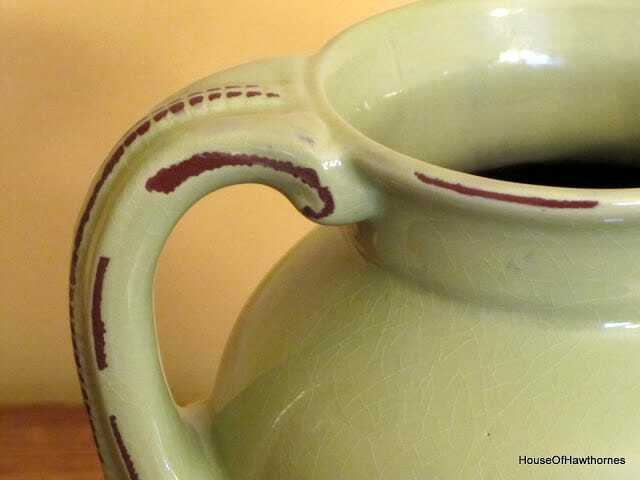 I have to disagree with you but that pitcher is NOT homely. I love it! McCoy oh my!!! OK This does not even seem like it can be garage sale stuff. Let me say, Towle is expensive, not sure how I know that, but I know it to be true. WOW you hit the mother load on the real McCOY!~ Love it. Holy Moly!!! I knew it was a McCoy(grandma has a corn one similar), but that price??? And the other items are AWESOME!!! I love the caviar dish, and have been wanting one, suchhhhhhhhh a great find! You did really well, the soup tureen is beautiful too. 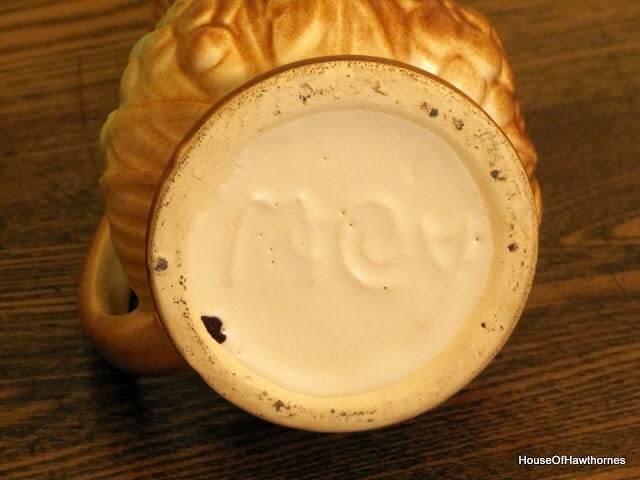 Love that McCoy…my favorite is the soup tureen!!! I love the pictcher and the soup tureen. I think that should be my next quest. 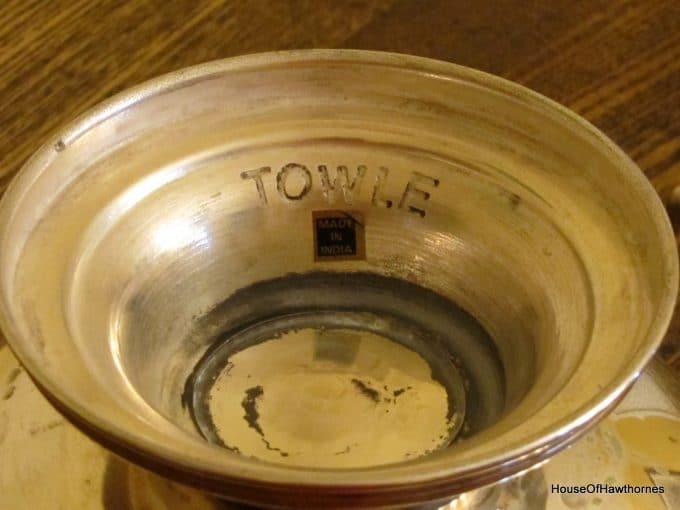 Finding a soup tureen. Wow, I don’t ever get lucky with a good McCoy piece like that~ great find! 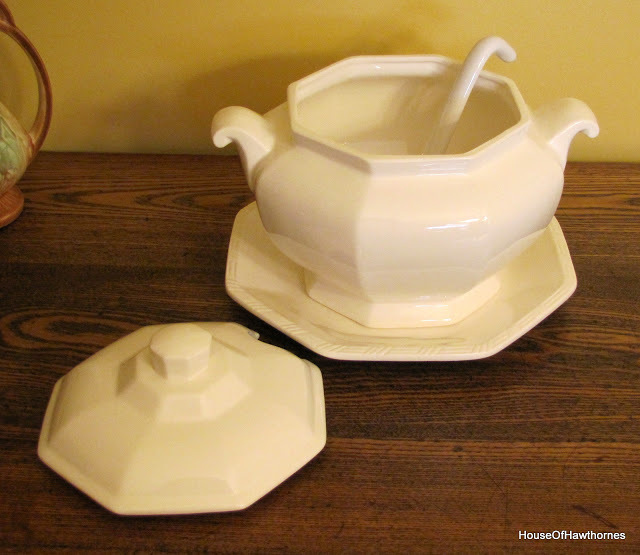 Great finds…I love the tureen and the caviar holder. Very cool! I think it would work great for holding dip…or shrimp cocktail?? Thanks for your lovely comments on my blog and for becoming a follower! My spooky Hallowe’en fence idea actually came from a Martha Stewart book that I have. There actually was a template for the Raven, but I just drew it myself. I used removable foam dots (for scrapbooking) to stick everything on the wall and it all comes off very nicely, without wrecking the paint. Great shopping as always, Pam. I really need to go shopping with you some weekend. You don’t serve caviar while watching football on Sundays? I tried it once. I’m really not a fan. I have featured you today at NTT…please feel free to grab my cute little starfish featured button for your blog and thanks for coming to my party! The real “McCoy”… great find. I have a couple pieces myself. You can tell it’s a McCoy by the glaze they used. Great finds! How wonderful to find a McCoy piece at a thrift store! Like you said, if it doesn’t grow on you, you can always sell it! I love the caviar dish too. Great finds. 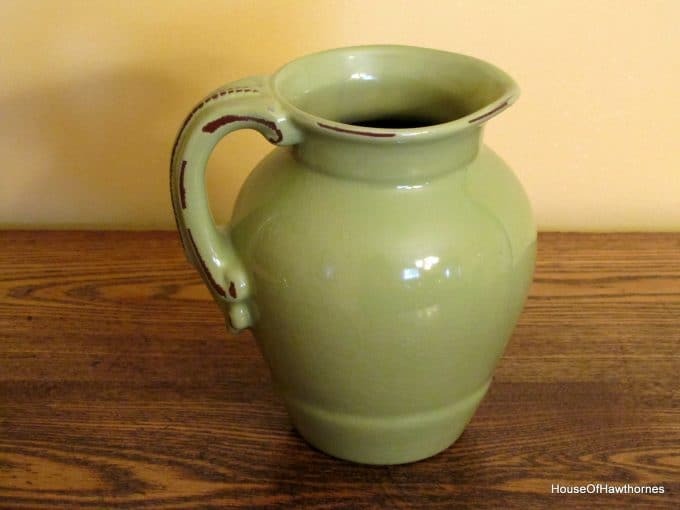 It’s so funny, but your “homely” pitcher is what my eyes first landed on! I love it! What a lucky find! And I really love all of your other treasures, especially the green pitcher! Cool Beans, Pam! You have some great finds. What’s with the odd cents on the prices? LOL If this is Goodwill, our store never has price points like that. In fact, try to find anything good under $10 and you’ll be there all day. hah… Wherever you were, you made out like a bandit. 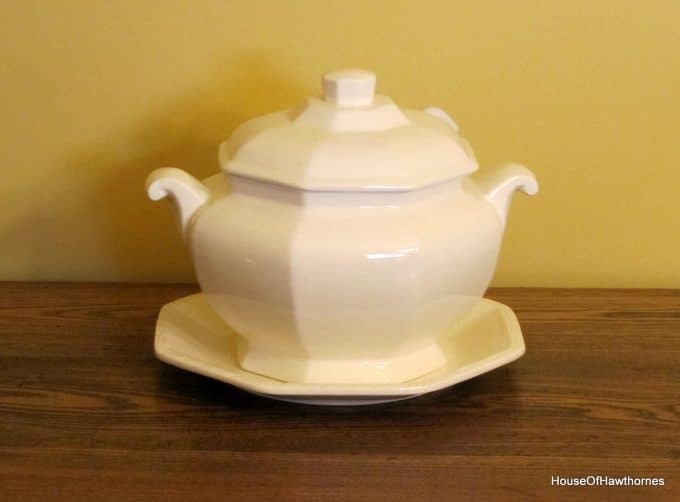 Love the tureen…I’m not a fan of the McCoy either, so from a personal point of view, I think I would attempt selling it. When we Buckeye Bloggers all get together one of these days, we’ll have to go junkin’ and thriftin’. It would be a fun excursion. Ooh! Look at all those lovelies! I’m totally coveting that tureen. I want one. Maybe if I say it in the comments section, I’ll find one too? :o) Thanks for sharing. Visiting from Coastal Charm. Happy Thrifting! Hi there. You found a lot of great things but I enjoyed your remarks about the “homely” McCoy and that you enjoyed a few beers at Chuck E. Cheese. You are a girl after my own heart! LOL! Yes! That has happened to me! In fact, I was obsessing over finding a soup tureen after seeing several other bloggers’ and did actually find one in Goodwill. I was thrilled beyond belief! It was in fantastic shape and the ceramic ladle was perfect too. I couldn’t believe there were no chips or stains or anything wrong with it!